For long time we have not make a soufflé – soft, delicate desserts with different flavors, most often baked in serving bowls. Need to be corrected. 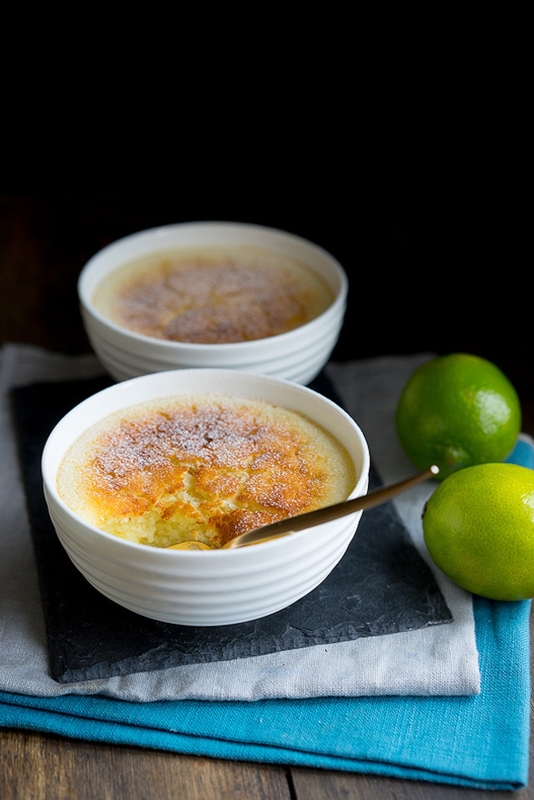 And to actively fight the autumn cold, you can cook something tropical – coconut-lime soufflé. If there are no limes, replace with one lemon. The texture of the soufflé is similar to a very soft bun, while it is wet and fragrant, each spoon melts in the mouth. The tastes themselves will truly remind you tropics! Here you can vary the components. Someone wants orange juice or berry juice. 1. Whip room temperature butter (60 g) and sugar (200 g) with the mixer until homogeneous. 2. Rub the zest of two limes and squeeze the juice (or 1 lemon). 3. Add zest, lime juice and yolks (3 pcs) to an oily mixture. 4. Add flour (125 g), baking powder (1 tsp), coconut shavings (40 g). 5. Add milk (180 ml), here you can take coconut to enhance this taste. 6. In a separate bowl, whip the remaining protein into a hard foam. 7. Carefully put protein into the dough and mix well with the spoon. 8. Pour into serving bowls, which put on a deep baking tray. You should get 3-4 cups. 9. Place the pan in the oven, heated up to 180 degrees. 10. Pour boiling water (in a pan) to the middle of the height of the cups. Thus the soufflé will be prepared more evenly. 11. Bake for 20-25 minutes, a confident golden crust should appear, and the skewer should leave dry. 12. Best of all is to put the cups on the grill to cool faster. About 10 minutes later you can sprinkle powder and serve. Soufflé is delicious as yet warm, and cooled down. The texture changes from completely airy to denser. 13. It's good to serve a soufflé with some thick creamy sauce or an ice cream.